Emily Blunt has been a constant on our cinema screens for over a decade now. She’s tried her hand at everything from comedy (with her iconic role in The Devil Wears Prada) to action (with Denis Villeneuve’s Sicario) to period drama (she played Queen Victoria in The Young Victoria) and even musicals (with 2014’s Into the Woods). With her latest role, she’s once again taking on something completely different: classic horror. 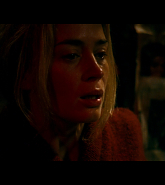 A Quiet Place, directed by and costarring Emily’s husband, John Krasinski, is not for the faint of heart. It’s a horror movie in the purest sense – so terrifying that you’ll be holding your breath and watching from behind your hands for the full 90 minutes – but at its core it’s also a heartbreakingly emotional story about parents just trying to do what’s best for their kids. EB: Yes, many times. Katy Perry–[At this point, someone hits their head on a lamp and it makes a huge noise.] Ooooh, someone just killed themselves. That was Katy Perry. [laughs] I also get – what’s her name, she’s fabulous – the girl in Gilmore Girls. Alexis Bledel! EB: [immediately starts laughing] This is where I’m going to get in trouble. I do a weird trick with my tongue. Do you want to see it? Mine’s better than most. There was a kid in my class when I was a young kid called Lysander, and Lysander could do that with his tongue, and I practised… [thinks for a second]. This is not a sexual trick, guys. I practised and practised until I got that tongue thing down. I tried to teach my daughters the other day.